China Microwave Dryer Machine for tea/Factory microwave green leaves dryer is applied to drying, ripening and sterilization of black Cereals, soybeans, mung beans, corn, wheat skin, buckwheat, oatmeal, soybeans and peanuts.Drying sterilization seafood seasoning, sterilization, drying, puffing Tenebrio; rose, tea and other tea flower.Conventional thermo - thermal sterilization starts from the surface of the material, but there is an internal and external temperature difference through the heat conduction to the interior. In order to maintain the food flavor, shorten the processing time. 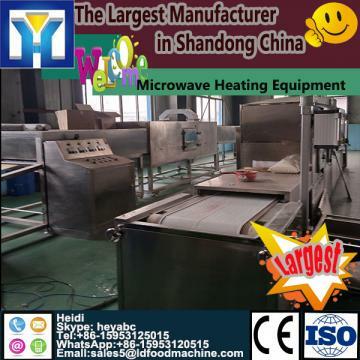 Microwave machine is used for drying and sterilizing various kinds of food, health food, spice,herbs,snack food, agricultural products, fish slice,meat, bean products, instant noodles, fast food, dried fruit, tea, karaoke powder, fruit and vegetable in the form of powder, granules, slice, etc. Also used in extract and liquid sterilization on beverages, nutritional supplements.